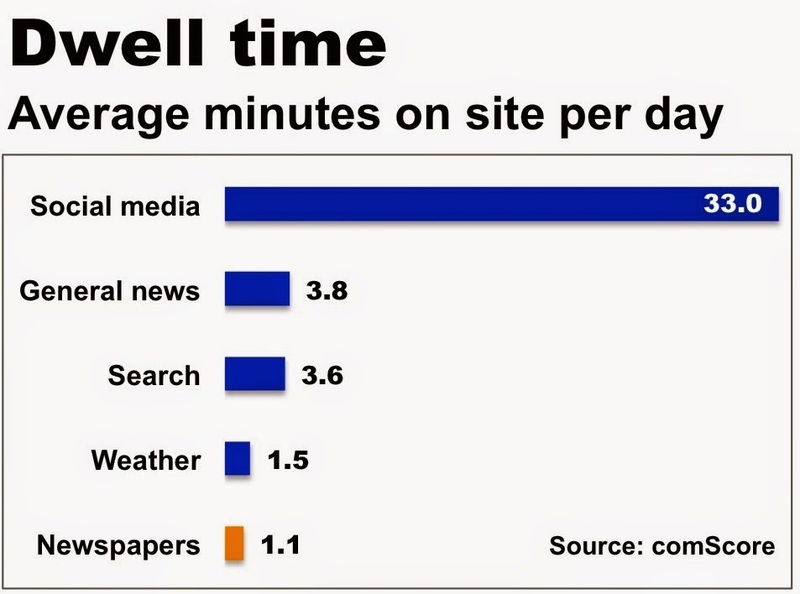 The following chart is all you need to know about the breathtaking contraction of the newspaper industry that coincided with the explosive growth of digital advertising in recent years. Take a look and I will tell you what it means. The reason the above chart starts in 2005 is because that is the year that advertising at the nation’s newspapers hit an all-time high of $49.4 billion, according to the Newspaper Association of America, an industry-funded trade group. That’s right. Fully a decade after us mere mortals became aware of the Internet, ad sales continued to surge at newspapers, leading publishers to believe this upstart medium was no challenge to the power, prestige and enviable profitability of their brands. At the same time newspaper revenues peaked in 2005, digital advertising hit a record of its own, surging to $12.5 billion after literally coming from nowhere in a decade, according to the Internet Advertising Bureau, a trade group. In the intervening years, as we all know, audiences and advertisers increasingly shifted their attention and patronage to the digital media, abetted by improving connectivity, generally falling costs and, most recently, a host of addictive mobile devices. So, it probably comes as no surprise that digital advertising surged 17% to a record $42.8 billion in 2013, surpassing for the first time the $40.1 billion spent on broadcast television advertising. At the same time digital ad sales advanced to a new record, print and digital ad sales at newspapers fell 7.1% in 2013 to a bit under $21 billion, according to figures released on Good Friday by the NAA. As detailed here, print advertising at newspapers last year fell 8.6% to $17.3 billion, representing the lowest level since 1982. Thus, the volume of print advertising, the primary revenue stream for the nation’s newspapers, is barely a third today of the record $47.4 billion in print ads sold in 2005. Almost as alarming to behold as the ongoing decline in print advertising is how little digital advertising grew at newspapers in the last 12 months in spite of the professed commitment of most publishers to pivot vigorously to the new medium. Digital advertising rose a mere 1.5% to $3.4 billion in 2013 at the same time that digital sales surged 17% across all digital categories in the United States. The weakness in digital ad sales last year is consistent with the industry’s performance in the last decade. Between 2003 and 2013, digital ad revenue at newspapers grew from $1.2 billion to $3.4 billion, making for a compound annual growth rate (CAGR) of a seemingly respectable 28%. In the same period, however, industry-wide digital advertising spurted from $7.3 billion in 2003 to $42.8 billion in 2013, representing a CAGR of 59%. 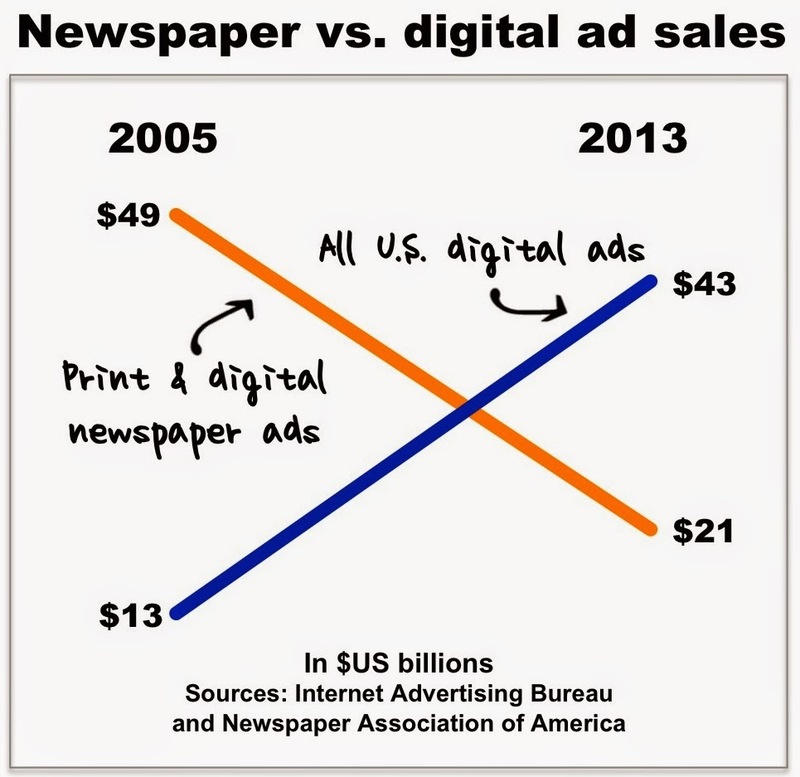 Back in 2003, newspapers had a 14% share of the national digital advertising market. In 2013, they had barely 8% of the market. At a time that growth and scale mean everything to the success of a digital publishing enterprise, the ongoing inability of newspapers to compete effectively in this emerging marketplace may be an even bigger problem than the traumatic collapse in print advertising that they have suffered over the last eight years. FOOTNOTE: Some sharp-eyed readers inquired as to why I say that newspaper print and digital advertising totaled $21 billion in 2013 vs. the $23.6 billion figure used by the NAA in its annual revenue report. The reason I used $21 billion is that the number maps exactly to the way newspaper ad revenues have been reported by the industry for the last decade. The additional revenue cited in the NAA report includes the sale of marketing services and revenues from niche publications. While publishers are benefitting from the addition of these new revenue streams, the apples-to-apples comparison of current and historical performance discussed in this post required the new revenue streams to be left out of the mix. When Rafat Ali launched Paid Content in 2002, he created one of the earliest successful digital publishing businesses by, quite cleverly, covering the emerging digital publishing business. Today, Ali is helping to revolutionize digital publishing again with a new venture that pioneers the use of data to not only develop high-profile, brand-burnishing stories but also to generate fresh, recurring and defensible revenue streams. Shortly after selling Paid Content to Guardian News & Media for some $30 million in 2010, Ali took a world tour to dream up his next big idea. As he traipsed from plane to hotel and hotel to plane, Ali realized that the information available to the 260 million people working in the $6.5 trillion global tourism industry was fragmentary, fragmented and hard to find. So, he launched www.Skift.Com in early 2012 to solve the problem – and, in the absence of significant competition, quickly became a leading news source for the travel industry. Unencumbered by a paywall, Skift sells high-CPM advertising and provides content to the likes of CNN, NBC, Quartz and Business Insider. Positioning itself as an industry thought leader, Skift also publishes two premium research reports each month, which it sells in a $99 package. Ali isn’t stopping with these well-established revenue streams. He now is embarked on gathering, analyzing and selling data about his readers – so he can sell it back to them through a product called SkiftIQ, which also costs $99 a month. In the first of what Ali says will be a growing array of datasets, he counted Twitter followers, Facebook likes, YouTube views and Instagram shares to quantify the marketing prowess of dozens of travel brands on the social media. Thus, Skift earlier this year determined that KLM was a more effective social marketer than American Airlines and Amtrak. While travelers may not care about the social-media mojo of their hotels, the information means a great deal to Marriott, Expedia, Lonely Planet, Airbnb, Norwegian Cruise Lines and all the other brands competing for mind- and market-share in a highly competitive and price-sensitive industry. Skift’s approach to gathering, crunching and selling data is not unique. It is but one of a growing number of next-generation digital publishers who understand that rich and granular data is the key to (a) personalizing content for busy consumers who only want to know what they need to know and (b) targeting ads for marketers who only want to pursue well-qualified prospects. Thoroughly modern digital publishers use data to identify and report stories; to understand and build audience; to improve reader loyalty and dwell time; to place targeted, high-value advertising, and to create products, like SkiftIQ, that they can sell to readers, advertisers or third-party services aiming to analyze consumer trends. Although Skift is a business-to-business publisher, consumer-facing media companies like newspapers and local broadcasters also can gather and disseminate data that is useful to their readers and advertisers. ∷ From the consumer point of view, Zillow updates home and rental values on a granular, almost-daily basis. It ranks the schools adjacent to each home. It estimates mortgage payments and property taxes. It even has developed a Walkability score that gauges how often you are likely to need a car to access supermarkets, parks and cafes. ∷ From the commercial point of view, Zillow has tons of pictures and data about homes in a neighborhood, which real estate agents (and consumers) can use to prospect for listings and develop price comparisons. In addition to selling display ads, Zillow sells listings that enable agents to promote themselves in the areas they serve. With so many datasets available on the web and so many tools available to analyze the information, why couldn’t newspapers combine demographics, crime data, home prices, school scores, air pollution readings and other data to create neighborhood livability indexes? For inspiration (and free tools), take a look at the data-centric reports that ProPublica has developed to explore education quality, dialysis mortality and much more. With the help of the Census Bureau, local business associations and companies like Pulse Research, publishers can capture data about commercial activity in their markets to track everything from the frequency of chiropractor visits to the volume of lawnmower sales. Beyond using this information to prod individual merchants to buy advertising, publishers or broadcasters can create trend reports that will appeal to consumers and businesses alike. To the extent local media companies become the leading data repositories in their communities, they will become indispensable to their readers and advertisers. That’s got to be good for their long-term franchise value. Schadenfreude broke out among some publishers today when Digital First Media killed an ambitious interactive publishing initiative and commenced layoffs to bolster the bottom lines of its newspapers in a reported plan to groom them for sale. But no one should be happy that Digital First hit the wall. All this episode proves is that digital publishing – which remains the only imaginable way forward for newspapers and other legacy media – is even harder than we think. 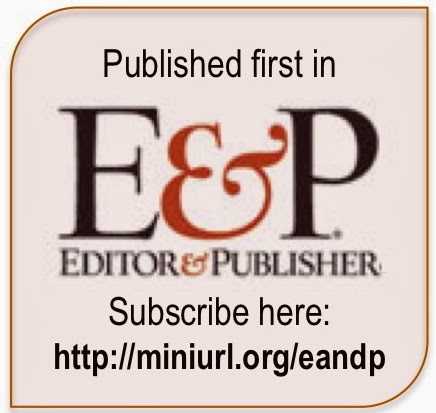 The problem with digital news publishing, as discussed here, is that few, if any, organizations have developed models that come close to successfully emulating the scale and profitability achieved in the best of times by the traditional publishing and broadcasting media. Sustainable revenues and profitability have eluded digital natives of all sizes, including both for-profit and not-for-profit ventures. And it most certainly has eluded legacy publishers, with newspaper companies like Digital First Media trying to crack the digital publishing code while battling an advertising collapse that has seen their collective revenues plunge by more than 50% since peaking at $49 billion in 2005. If digital publishing is so tough, then why are so many new entrants coming out of the woodwork? The answer, quite simply, is that content has become a hot area for venture investing. To name but a few examples, Vice Media has raised $70 million, Vox Media has raised $60 million and BuzzFeed has raised $46 million, according to Tech Crunch, which raised $25 million itself. This is not to mention Facebook, the biggest publishing platform of them all with $13 billion in cash, $7.9 billion in sales and a 37% operating margin. The magic of Facebook, of course, is that all the content is generated for free by its users. Because venture investors favor exponential growth in audience and page views over such traditional metrics as revenue and profitability, they are content to underwrite these new digital ventures in the hopes that they will grow to the point they will merit an IPO or be acquired by a well-heeled player. Unfortunately for self-styled publishing visionary John Paton, the chief executive of Digital First, he picked the wrong vehicle and the wrong financial backers to pursue his digital quest. Paton ran out of time and resources to pursue his vision because he had the wrong financial backers. Digital First Media is a collection of dozens of newspapers, including the Denver Post and San Jose Mercury News, that had been bought in bankruptcy by Alden Global Capital, a distressed-debt specialist looking to buy properties on the cheap that it could fix and flip for a quick profit at the earliest opportunity. In other words, the objectives of the Digital First investors were the antithesis of the patience – and multimillion-dollar commitment – required in the slog to identify successful interactive publishing models, whatever they eventually may turn out to be. It would be a mistake to view the failure at Digital First as a failure of digital publishing or a reason to stop trying to get it right. The only thing this sad chapter proves is that the pivot from legacy to digital publishing is going to be harder than we imagined.